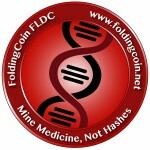 FoldingCoin, Inc proudly offers the ability for your project to distribute your tokens to participating Folding@Home users with the Merged Folding platform. Using this tool, you may distribute your token to some or all of the participants based on your own criteria. We currently track contributions from between 1,500 and 2,000 participating altruists each month who could receive your token via Merged Folding. Promote altruistic scientific research (like Protein Simulations) by providing economic incentives to the Folding@Home network. This is excellent public relations for your company and token as your distribution will be literally helping to encourage life-saving medical research. Giving away your token to our community not only assists with medical research, but also gets the attention of one of the most engaged communities of medical research and cryptocurreny enthusiasts. Even do a pre-release distribution of your token to get our community excited about your new product. Create a special token that works within your platform that can only be earned via folding. This helps to incentivize people in our community to be more engaged with your project if there is a token they can only earn via folding. FoldingCoin, Inc. provides this service for free, you only need to pay the BTC required to confirm the transactions of your tokens to be sent to our participants. Our powerful software tools gives you thousands of options for distributing your token. Give to all folders, just folders that meet certain criteria, and more! You can give away tokens proportionally to our Folders based on computational power or give a set amount to each participant regardless of computational work. You can choose to give away randomly to our Folders, or even choose to give away to only the Folders who have given a certain amount of computational power. You set the number of tokens you will give away. There is no minimum or maximum requirement for the number of tokens you give away. You pick whether to award your tokens to folders active only on a given day or use the entire multi-year Foldingcoin history as your guide. You can give your tokens away for a limited time, or indefinitely. You have options. Airdrop your token to thousands of cryptocurrency enthusiasts and support medical research at the same time! The MergedFolding project is a collaboration between the FoldingCoin, Inc. (FLDC) team, a 501(c)3 public charity, and Tokenly, a tech-startup that builds blockchain and cryptocurrency software for token distribution, eCommerce, and token-controlled access applications.